It’s not unusual for New York City streets to be crowded with people, but on this particular morning in Times Square, thousands gathered outside of the Good Morning America studios in anticipation for the one and only, Lady Gaga. 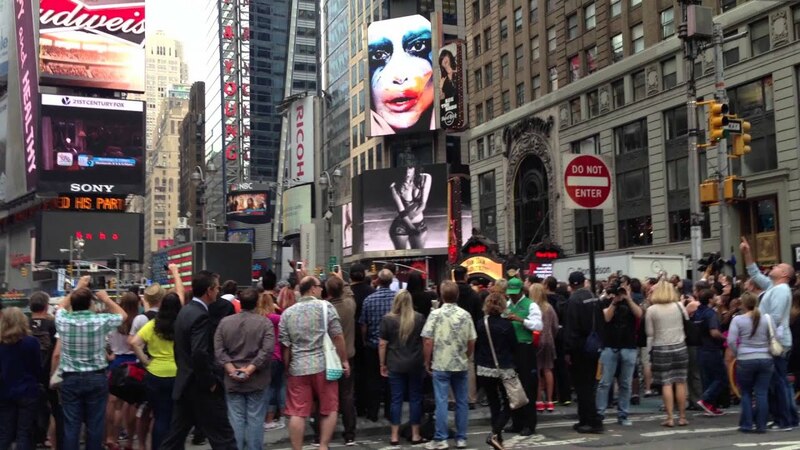 On Aug 25, Lady Gaga’s fans, known as Little Monsters, stood in awe and excitement as they watched the premiere of Gaga’s new music video, Applause projected onto Times Square billboards on behalf of Good Morning America. The singer met with fans and sat down for a live interview with GMA as she talked about her love for her fans, and that she in fact (like the song references) “lives for their applause.” Even after a recent hip surgery that cancelled 51 of her tour stops, Lady Gaga’s fans came to support her and her newest album effort ARTPOP. So what is it about Lady Gaga that has her Little Monsters hanging onto every lyric, melody, and piece of merchandise? It seems her career has been built on the principles of PR layed out in the book Tribes by Seth Godin. Written to inspire professionals to stay in touch with their target audiences, Tribes discusses the importance of building trust and loyalty between the brand and its followers. 1. Motivate people who choose to follow you. By analyzing the state of pop culture, Lady Gaga shot to instant fame as she led a following of outcasts, people who felt disenfranchised by society, and marketed to their wants and needs. The desire for a loyal relationship spawned this connection and through songwriting, rallying, protesting and speeches, Lady Gaga communicated to her public that she would always support their fight. Godin says, “You don’t need plurality or even a majority. In fact, in nearly every case, trying to lead everyone results in leading no one in particular.” Innovation in leadership lies within the ability to choose the tribe you will lead. Leadership will then resonate with the tribe. 2. Build trust through Twitter, it’s for your true fans. Rather than focusing on how many fans you have, the focus should be placed on building a true fan base, by committing to fans through social networking, most importantly, Twitter. By instant messaging all who choose to follow you, a fan can build a relationship with who they are following. Gaga reads what fans say when they tweet her, and they listen to her. It is an interdependent relationship that has earned her more than 40 million Twitter followers. Not only does Lady Gaga utilize Twitter, she took things a step further in 2012 and created a social media site just for her fans at LittleMonsters.com. This innovation in brand social media has created a new way to connect with the tribe, as she visits chat rooms and shares pictures exclusive to the site. Fans can also post artwork, music, and film projects to share with each other. No pop star creates a micromovement better than Lady Gaga. Creating a movement, even a small one, provides great opportunity for connections to be made, pushing toward a cause and uniting people toward a specific mission. By sparking a movement, it is then left up to the people who chose to follow it, to propel it even further. Early in Lady Gaga’s career, she openly spoke about social injustices for females and the gay community in interviews. But with the album Born This Way, she put her beliefs into the music and thus propelled the movement, giving fans anthems to celebrate who they are. The album is the structure and the output is what she poured into the music itself. In an interview with Anderson Cooper, Gaga talked about the principle of transparency — being completely open and honest with her fans. Gaga repeatedly says to her fans that “they make her brave, and that now she will be brave for them.” This keeps the movement thriving and the conversation going. The principle of excluding outsiders is discussed in Tribes and Gaga demonstrates this during her performances. At one point during her concerts, she says, “Tonight Little Monsters, the freaks are outside, and I locked the f–king doors.” Lady Gaga also launched her charity, The Born This Way Foundation, a project meant to inspire bravery in young people. This entry was posted in Archer PR, Uncategorized and tagged abc news, applause, ARTPOP, good morning america, Lady Gaga, micromovement, PR, public relations, Seth Godin, tribes, twitter. Bookmark the permalink.